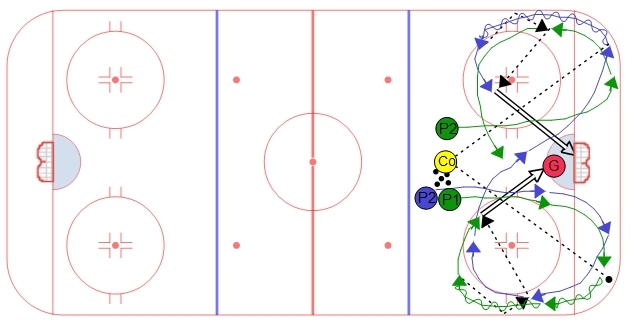 This is a half ice skating drill that is great for most age levels. It emphasizes quick feet and quick changes of direction. To set up the drill have the players line up in the middle of the ice on the blue line facing the net. The players will go in groups of two or three. The players skate to the bottom of the circle and around the circle back to the middle and to the inside of the cone then back outside around the top of the next circle. See the diagram and animation for clarity. Switch directions each time. Players should never stop moving their feet. Make sure players are skating hard all the way through the blue line. 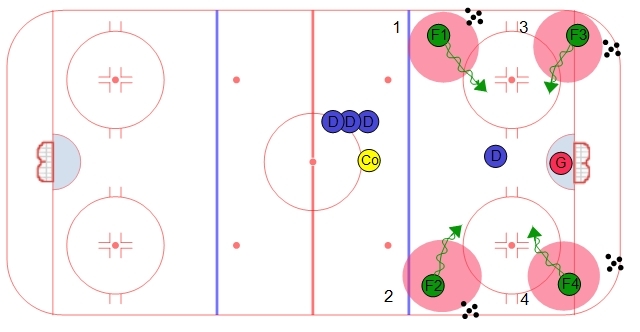 When skating around the circle player should stay low and get a strong push from the cross-under. Rotate the chest towards the middle of the circle. This is a progression from the normal Peanut Overspeed Skating Drill. The players follow the same exact path but they will pivot forwards to backwards and vice-versa at certain points. When crossing over forwards be sure to rotate chest towards inside dot. Always pivot towards inside dot. When Going backwards be sure to grab as much ice as possible when crossing under. 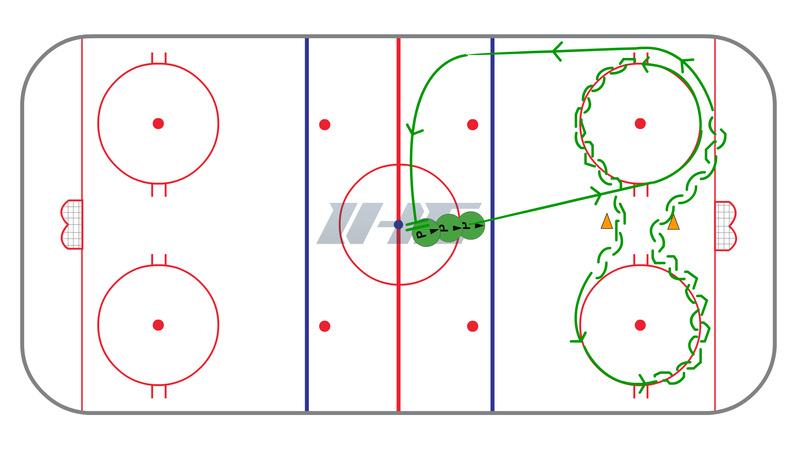 This is a good half ice hockey drill that works on one-touch passing, transitions, quick shots, and following shots to the net. To set up the drill place one player along the goal line in-line with the dots. Place two lines just inside the blue line also in-line with the dots, these two lines have the pucks. The first player (Player 1) in line will make a pass to the player on the goal line (Player 2) and skate directly at them. The two players on-touch the puck back and forth as many times as possible. Once Player 1 gets below the dot they transition towards the wall and facing Player 2. The players continue to one-touch the puck as Player 1 skates up the wall, around the top of the circle, and into the slot. When Player 1 receives the puck in the slot they take a quick shot and follow their shot to the net. After the last pass Player 2 will also go to the net looking for a rebound. Player 1 then continues to the other side along the goal line and becomes Player 2 as the drill now starts from the other side. The original Player 2 now goes to the end of the line. Players should make flat passes with soft hands. Slapping the puck results in in-accurate passes and wobly pucks. Players should transition while facing the puck at all times. Receive and shoot in one motion when in the slot. Make sure both players follow shots to the net. The coach starts the drill by dumping a puck in the corner. F1 retrieves the puck and carries it up the wall while F2 follows F1. After the hash marks F1 cycles the puck down low for F2 and then F2 passes it back quickly for F1 in the slot. F1 shoots the puck and stops on the net for a rebound. F2 continues through the slot as the coach dumps another puck int he opposite corner. Now F2 becomes F1 and retrieves the puck in the corner while the next player in line becomes F2 and follows F1 down low. The drill repeats in this sequence. This drill can be very challenging for defensive players. The drill forces players to work on taking away time ans space in the defensive zone, recovering from a disadvantageous position, and stamina. 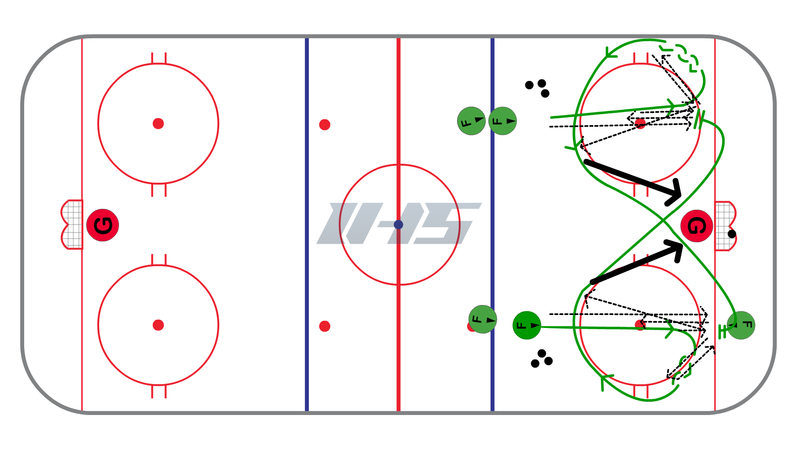 To set up the drill place four lines of players in each corner of the zone with pucks as shown in the diagram. The coach will name each line 1,2,3, or 4. Make sure all players are fully aware of the label for each line. The defensive player will start in the middle. To start the drill the coach yells out a number. The first player in that line will attack the net. The defensive player has to react and play the 1 on 1. On the whistle, that play stops and the coach yells out a new number from which the next player attacks the net 1 on 1. This sequence repeats 4 times so that the defensive player plays four 1 on 1's, one out of each zone.